Romesco, romesco where have you been all my life? What’s not to love about a piquant and savory sauce whose primary ingredients are sweet, juicy tomatoes and red bell peppers – especially in September, when these vegetables are at their peak in Michigan. And your waistline will surely appreciate a lusciously rich sauce that’s thickened with almonds and bread, instead of butter and heavy cream. This classic sauce from Tarragona, in Northeastern Spain, is typically made from any combination of nuts, tomatoes, peppers and bread with the remaining ingredients left to the palate, whim and discretion of the cook. I decided to season my Romesco with saffron, Spanish sherry vinegar, and Marcona almonds – ingredients typically used in Spanish cuisine. 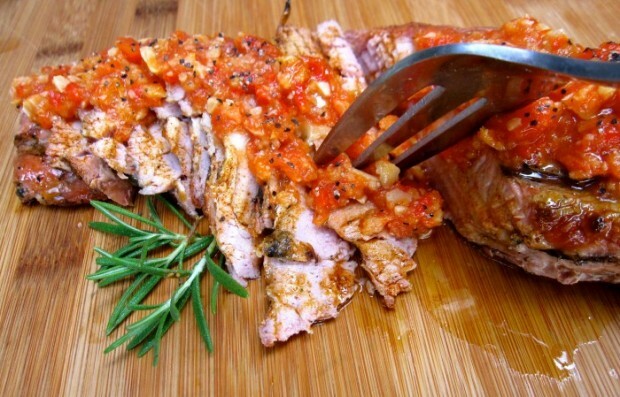 Romesco is marvelous on grilled pork, and the following recipe is a perfect dish for entertaining at this time of the year. But it can be tricky cooking pork for a dinner party – everyone has an opinion as to the proper level of doneness. I have friends who prefer pork rare, and others who insist it’s cooked completely through. My taste falls in-between to medium-rare; pink and juicy in the center. It’s still hard convincing those with a trichinosis mind-set that they should adapt their palate. But no worries: cooking 2-3 tenderloins makes it easy; cook each tenderloin to a different level of doneness – everyone’s happy. The following recipe serves eight – perfect for a dinner party – but is easily divided. If making for company, the directions can be adjusted so that the dish may be made ahead. I didn’t want to be monitoring a grill, juggling pans and a food processor after my guests arrived, so I did the cooking in advance. Here was my plan: I grilled the vegetables and make the sauce two or three hours before show-time. Then, I under-grilled the pork to 135 degrees and wrapped it in foil, reheating both sauce and pork prior to serving. For a side dish, I boiled large, quartered redskins in salted water until they were just beginning to tenderize but still firm. After draining, I tossed the hot potatoes with olive oil, a bit of butter, dry vermouth, chives and additional salt and pepper to taste. I covered the pan and let them soak up the flavors and tenderize in their residual heat to perfection, quickly reheating before serving – marvelous with the Romesco. Charcoal and hardwood lent a smoky flavor to the vegetables and pork, but if grilling over gas, I’d rub Spanish smoked paprika into the pork before grilling. This makes a big batch of sauce and you’ll likely have leftovers. All the better. It keeps well refrigerated up to a week, and is delicious tossed with pasta, draped over grilled vegetables, fish or chicken, stirred into a lentil soup, or used as a dipping sauce for vegetables or crostini. Prepare a gas or charcoal grill to medium heat. 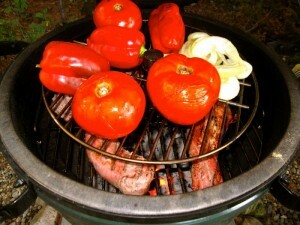 On an oiled grill grate, grill tomatoes, onion, and peppers until vegetables are slightly charred and blistered on all sides; remove from heat. When cool enough to handle, remove skin from tomatoes and peppers, removing seeds and membranes from peppers. Place tomatoes, peppers, onion, chicken stock and 1 teaspoon rosemary in a deep saucepan; bring to a boil then reduce to a simmer and reduce stock stock 15-20 minutes. Meanwhile, soak saffron in 2 tablespoons vinegar 5 minutes then stir into pot. In batches, with on and off pulses, coarsely chop tomato mixture with bread and almonds so it remains chunky. Add kosher salt, freshly ground pepper and additional vinegar and rosemary to taste, if needed. Slice pork into medallions and serve with sauce. *I omitted the rosemary as the Marcona almonds I used (The Trader Joe’s brand) were seasoned with rosemary lending enough herbacious flavor to the sauce.